At the invitation of the Gujarat Government, Governor Brigadier (Retd) Dr BD Mishra and his wife Neelam Mishra visited the Statue of Unity, the memorial for Sardar Vallabhbhai Patel, near Kevadia town of Narmada district on Monday. Carrying the goodwill of the people of Arunachal Pradesh, the Governor paid respect to Sardar Patel, the epitome of India’s unity immortalised as the world’s tallest statue. While complimenting Prime Minister Narendra Modi and the people of Gujarat for the conceptualisation, planning and construction of the monument, the Governor mentioned about the keenness of the people of the easternmost part of India to visit the symbol of unity in the westernmost State of India. He said that along with the promotion of the spirit of unity in the country, it has a huge tourism potential as a large number of tourists are visiting the statue. Besides the statue itself, there are several other tourist attractions around including the Valley of Flowers, natural beauty of the Satpura and Vindhyachal hill ranges besides the Sardar Sarovar Dam on the Narmada River. Impressed by the tourism aspects, the Governor met the Union Minister of State for Tourism KJ Alphons on Wednesday and took up issues related to the development of tourism in Arunachal Pradesh. He emphasised that harnessing the tourism potential of the State will change the course of development in Arunachal Pradesh. By promoting the ecological, adventure, cultural, rural and religious tourism in the State, it will ensure quantum jump in the revenue for the State and nation and also have a positive impact on the ‘Act East’ policy. The Governor had an in-depth discussion of ‘Pay Back to Society’ initiative and Kendriya Vidyalayas in selected border villages of Arunachal Pradesh. 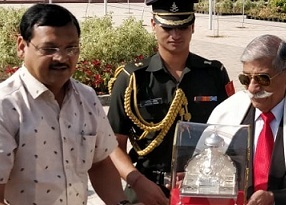 Continuing his endeavour in the core sectors of education and employment opportunities, the Governor met the Chief of Army Staff, General Vipin Rawat and also Commissioner, Kendriya Vidyalaya, Santosh Kumar Mall. Mal is visiting Itanagar on November 19-20 next to discuss and finalise the opening of six Kendriya Vidyalayas in Arunachal Pradesh.